BioZyme recently hired Guy Rusche of Garretson, SD as a BioZyme Area Sales Manager for its supplement division. In this position, Rusche is responsible for promoting sales of BioZyme products and supporting BioZyme’s dealer network in South Dakota. BioZyme’s supplement brands include VitaFerm®, Sure Champ®, Gain Smart™, VitaCharge® and Vitalize®. Prior to BioZyme, Rusche worked as a Beef Specialist for Summit Livestock Facilities in Remington, IN. He has more than 20 years of experience in the livestock industry and a Bachelor of Science in Animal Science from South Dakota State University. 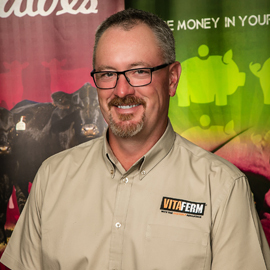 “Guy is a native of South Dakota who is very knowledgeable of the cattle industry and has the desire to provide excellent service to BioZyme’s customers. He will be a great asset to the cattlemen in South Dakota,” said Mike Wadle, BioZyme Director of National Sales – North. Rusche also owns a herd of registered Corriente cattle and is a member of the South Dakota Cattlemen’s Association, AQHA and the North American Corriente Association. Rusche grew up on a 3,000-acre diversified beef and grain operation, which included a commercial cow/calf and backgrounding/feedlot operation.